Measuring the activity of ion channels at the single molecule level provides a deep understanding of their structure and function. Currently, single molecule recordings are typically obtained through either patch clamp or planar lipid bilayer (PLB) methods. 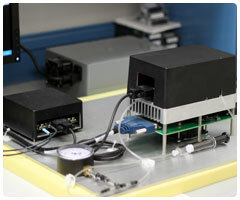 While patch clamp has delivered much higher sensitivity than PLB platforms, the patch clamp technique requires extensive user training, complicated operations, and a wide array of expensive instrumentation. In contrast, PLB methods are easier to implement, allow for finer control over experimental conditions such as lipid and electrolyte composition, and enable investigation of ion channels present in intracellular membranes. However, standard PLB platforms produce high noise, thus precluding the measurement of low conductance ion channels except at very low bandwidth. The Nanopatch™ combines the best of both worlds by providing the high sensitivity of patch clamp with PLB versatility. The quartz nanopore membranes (QNM) at the heart of the Nanopatch™ system provide very low capacitance and dielectric loss, enabling high bandwidth measurements with exceptionally low noise. The QNMs are tightly integrated to our custom amplifier to produce unprecedented noise levels for PLB platforms (0.22 pArms at 10 kHz with the capacitive feedback amplifier and 0.30 pArms at 10 kHz with the resistive feedback amplifier). EBS and our collaborators at the University of Utah and UC Merced have successfully demonstrated the insertion of bacterial porins αHL and gramicidin, multimeric proteins such as cardiac ryanodine receptors (RyR2), and the cold activated transient receptor potential melastatin channel, Trpm8. Proteins have been incorporated either through liposome formation, or in some cases, by direct insertion from detergent solubilized solutions.